The boa constrictor is a sizable type of snake that resides in both South and Central Americas and also in the northern region of Mexico. The massive, non-venomous New World reptiles go after their prey using their chompers and then they aggressively twist themselves around the vulnerable quarry bodies, hence the intimidating moniker "constrictor." Boa constrictors are sturdy snakes that usually have tan, cream or beige bodies. In terms of markings, the snakes possess blackish crossbands that get increasingly darker and more conspicuous near the lower portion of the body. Boa constrictors are capable of living in a wide array of environments, including damp tropical forests, deserts, rugged hillsides, savannas, semi-deserts, agricultural areas, thorn scrub and grasslands. Some boa constrictors are big, but other boa constrictors are really big. At the time of publication the largest confirmed boa constrictor was 18 feet in length, according to National Geographic -- significantly longer than the average snake of this group. In terms of length, fully mature boa constrictors typically reach heights of around 13 feet, according to the Smithsonian National Zoological Park. The largest verified boa constrictor was a full 5 feet longer than that. It is not very common for boa constrictors to surpass 11 feet long. Boa constrictors enter the world already around 24 inches long, which is longer than the length of typical newborn human beings. In adulthood, the typical weight of a boa constrictor is around 60 pounds. 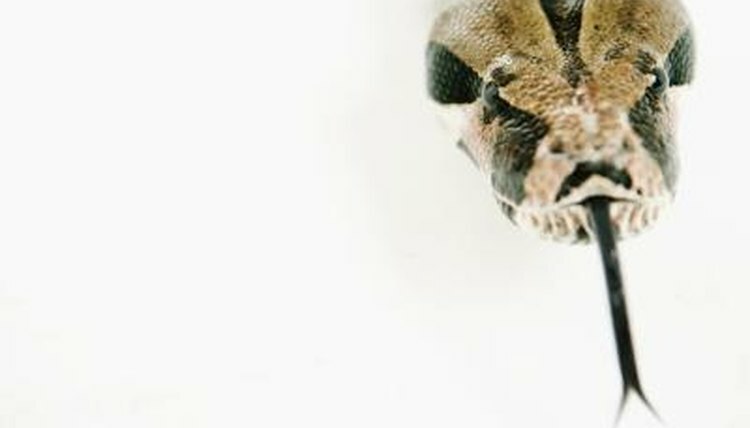 An individual boa constrictor's diet may have some effect on his size. The carnivorous reptiles are not choosy about their sustenance and feed on many types of animals, including monkeys, birds, pigs, mongooses, opossums, squirrels, rats, bats and lizards. Boa constrictors are usually especially partial to bats as a dining choice. The anaconda is another variety of boa snake, although it generally is much bigger than its constrictor counterparts. Anacondas usually are between 20 and 30 feet long, indicates the San Diego Zoo. These immense snakes can even weigh up to 550 pounds.